But Walsh’s comments did not address the broader issues of the IRS audit of city finances, which found problems beyond the school department, resulting in nearly $1 million in penalties. The Globe first reported about the findings on Monday. Walsh also appeared to blame some of the problems on former mayor Raymond Flynn, noting many of the issues the IRS detected date back to the 1980s. The agency issued seven findings, four of which centered on mismanagement of student activity accounts at Boston schools. Walsh delivered his blistering comments in front of a gigantic salt pile at the Department of Public Works headquarters in South Boston, following a press conference on the city’s efforts to prepare for winter storms. 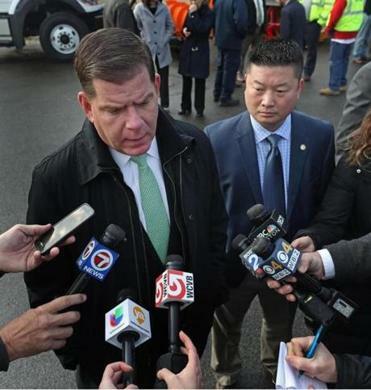 Chang stood silently by Walsh’s side, and at no point did Chang attempt to defend himself as the mayor took questions from a reporter on the issue. 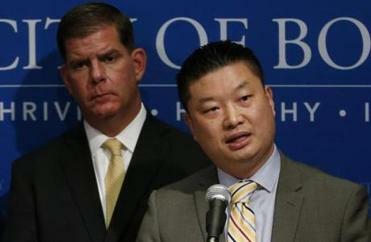 But for some parents and education advocates, Walsh’s criticism of Chang was ringing a bit hollow. While the IRS audit exposed systemic problems in bookkeeping at individual schools in their handling of student activity funds — such as not keeping receipts and paying stipends under the table — the problems represented a small fraction of the IRS fines: $30,000 out of $944,000. Walsh’s comments came a month after he expressed concern about Chang’s handling of struggling high schools. Last year, he also quickly shot down Chang’s plan to study the possibility of revamping the admissions policy at the city’s exam schools, saying he knew nothing about it until he read a news report about it. The Internal Revenue Service began its audit over a year ago, and it also found the city did not properly deduct Medicare taxes and other payroll taxes for some groups of employees. The city’s finance team took the lead in handling negotiations over penalties. Negotiations ended on Nov. 2, and city officials said that the city issued a check to the IRS five days later, on Election Day. That was two weeks before Walsh says he knew about the findings. The Globe’s initial story on Monday focused on the school findings. The city then confirmed a day later that the IRS found problems with the city’s payrolls and released details on those findings. The School Committee first learned of the findings last week after a Globe reporter made an inquiry to the School Department about a memo Chang sent to principals in June regarding the IRS’s initial findings while the audit was still ongoing. Chang has taken responsibility for not informing the School Committee sooner and has apologized to the board. On Wednesday, he reiterated some of the steps his administration has taken, such as retraining principals over the summer on proper uses of student activity funds and reporting all stipends paid with the funds, so they can be taxed. But Chang also said he did not get the final version of the IRS findings until last week, even though he had alerted principals in June about what the IRS had discovered so far with the student activity funds as the audit persisted. The IRS reviewed expenditures from a sample of 16 schools and determined three-quarters of them had problems. In some cases, schools failed to fill out the appropriate tax forms for vendors, making it difficult for the IRS to determine if the appropriate parties paid taxes. In other cases, the IRS found schools paid stipends to employees under the table instead of adding it to their paychecks so they could be taxed, failed to keep receipts, and used funds for expenditures unrelated to student activities. One of the most egregious offenders was the Sarah Greenwood K-8 School in Dorchester, which spent $19,916 in student activity funds, but threw away the receipts, preventing the IRS from determining if the money was spent appropriately. The state and federal governments have established strict uses for student activity account funds, which are to be used only for extracurricular activities that enhance a student’s educational experiences outside the classroom, such as student clubs or field trips. The rules stress the money belongs to the students, not the adults or the institutions. Inappropriate uses include teacher appreciation, parent open houses, child-care services, and textbooks and classroom supplies. Money for student activity accounts is often generated through fund-raisers or proceeds from student events, such as ticket sales from proms. This was the IRS’s first audit of city finances in at least three decades, one city official said, although some watchdogs have questioned why the city’s own internal audits through the years did not detect the problems. Flynn, who served as mayor from 1984 to 1993, defended his administration’s handling of city finances. He also noted that for most of his administration, the school system operated completely independent of City Hall, preventing his administration from having any control over its finances. That changed in 1992 when the elected School Committee was replaced with a board appointed by the mayor. Flynn departed as mayor a year later when he became ambassador to the Vatican. “At that time, Professional Rating Agencies and independent financial agencies, gave the City of Boston a positive rating and audit,” he said in an e-mail.